This past Friday I was Twittering away in NYC, and Andrew from England mentioned he was looking at some webcams in Times Square. 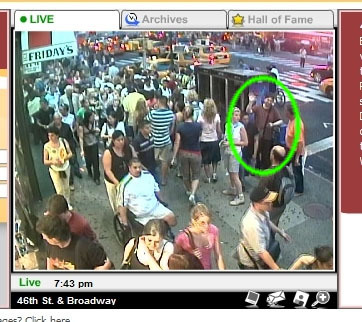 So, when I got to Times Square I found the webcam he was looking at and Twittered to him I was there, and then a bunch of people on Twitter also tuned in to the webcam and took a lot of pics. Check out the discussion on the forum here and here. 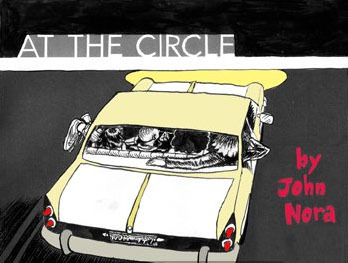 Check out my brother’s comic, “At The Circle”, online at Walrus Comix. The comic is based on true events from January of 1987 when I was making a video movie called “The Evil Farm” with a bunch of local juvenile delinquents in and around Somerville, New Jersey. The character holding the video camera is based on me. I have never released the video version of “The Evil Farm” online, but I plan to at some point. I did create an audio version of “The Evil Farm” which is available online, but only in lo-fi form. I plan on a hi-fi release of the audio version in the near future. Until then check out the lo-fi MP3 of the 10-minute edited version above (not safe for work). You can hear the actual audio of some of the dialog in the comic! The 2007 Podcast Awards winners were just announced. The Overnightscape, nominated in the General category, did not win. I want to thank everyone for all the time and effort spent voting, many of you every day. It was great to see all the effort on behalf of the show! The show that won in the General category, “Show Girls”, is run by this guy Franklin McMahon, and the stars include Karen and Karla from Rumor Girls, KFC from Sky Diver Girls, and Soccergirl – all of whom I like and have met at various podcasting events – so I am happy for them, and congratulate them on winning. Out of 4,097 shows nominated, The Overnightscape was one of the 220 finalists (actually 201 since 19 shows were nominated in 2 categories) – so that in itself is pretty cool. Thank you all for nominating the show! The Overnightscape is a nominee in the GENERAL category, along with 9 other shows. Voting lasts for 15 days, starting Saturday, July 28, 2007 and ending Saturday, August 11, 2007. You can vote once per day – so make sure to vote every day! The Overnightscape was previously nominated for a Podcast Award in the “Cultural/Political” category in 2005, but did not win. It was not a nominee in 2006. This year, 2007, we have a real chance to get the award!! !